February is Children’s Dental Health Month. As a parent, your child’s health and protecting it are your #1 concern. Heath recommendations for children are constantly changing as new health studies and information become available, and it can be hard to stay on top of it all. To help you out, we are answering some of the most-asked questions by parents about their children’s teeth and dental health. Q: ARE HEALTHY BABY TEETH THAT IMPORTANT SINCE THEY WILL FALL OUT EVENTUALLY? A: Baby teeth are small but important. Healthy teeth are necessary so your baby will have no problems chewing food and speaking clearly. Baby teeth also act as placeholders for adult teeth. If teeth are infected or lost too early, your child may develop poor eating habits, speech problems, or crooked teeth, along with a greatly increased chance of crooked permanent teeth. Also, bacteria can quickly move from one part of the mouth to another, resulting in infections and cavities in newly erupting adult teeth. Not to be discounted are the emotional effects to your child of decayed and painful teeth. It can affect their social interactions and skills in a way that will negatively impact them throughout their life. Having a healthy smile is important no matter how old you are! 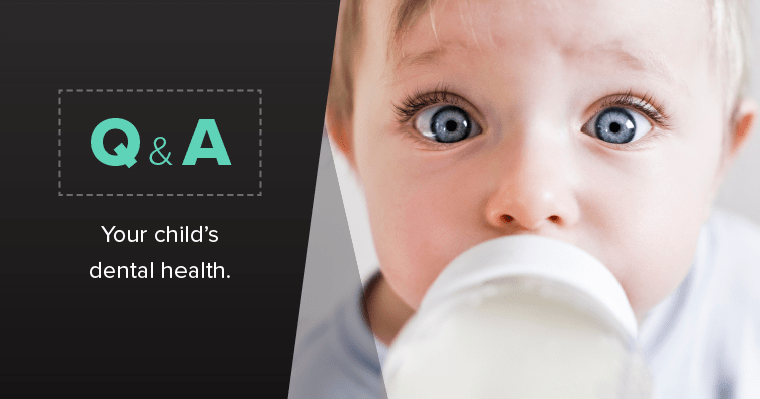 Q: HOW CAN I PREVENT “BABY BOTTLE DECAY”? If you see any signs of cavities – unexplained red or swollen areas in your child’s mouth, or a dark spot on a tooth – consult your dentist right away. Q: ARE THUMB-SUCKING OR USING A PACIFIER HARMFUL TO MY CHILD’S TEETH? 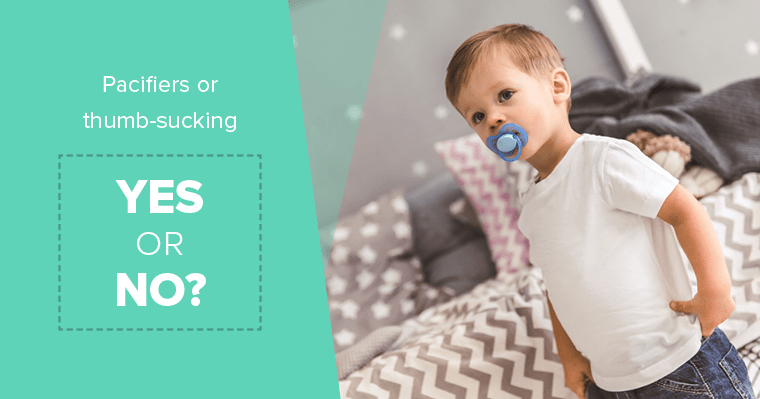 A: Thumb-and pacifier-sucking habits will generally not cause a problem if practiced for a limited time. Your child should not be using a pacifier past the age of 3. Changes in the development of the bite can begin as early as 2 years old so it is important to limit thumb and pacifier sucking to prevent future orthodontic treatment. Most children stop thumb-sucking on their own, but if they haven’t by the age of 3, your dentist will have some recommendations on what to do. Q: WHEN SHOULD MY CHILD BEGIN USING TOOTHPASTE AND HOW MUCH SHOULD BE USED? A: At first, simply use a wet toothbrush. For toddlers over two, you can start using a pea-sized amount of fluoridated toothpaste. Fluoride can upset little tummies, so it’s important to train your children not to swallow their toothpaste. Your children will need assistance with proper brushing techniques until about the age of 7 or 8 when they begin to develop fine motor skills and can brush effectively on their own. Q: SHOULD MY CHILD HAVE DENTAL SEALANTS? A: Sealants are recommended as a safe, simple way to help your child avoid cavities. Although thorough brushing and flossing can remove food particles and plaque from smooth surfaces of teeth, they cannot always get into all the nooks and crannies of the back teeth, like molars. Sealants protect these vulnerable areas from tooth decay by “sealing out” plaque and food. Children should get sealants on their permanent molars as soon as these teeth come in, helping to protect them through the cavity-prone years of ages 6 to 14. Since most insurance companies will cover the cost of sealants for children, ask your dentist if sealants are a good option for your child. Did we get your questions answered? Probably not all of them as we have enough space to only deal with the most frequently asked questions. There are many more important questions we could discuss. If you have questions about your child’s dental health, your dentist and dental team are the best resources when it comes to finding answers to your questions since they know you and your child personally and would love to help. Also, feel free to ask your question about children’s dental health in the comments below.